Issued by King Aerospace Commercial Corporation. The green BBJ's paint scheme will include four separate silver and blue pearl paints as well as multiple, nose-to-tail geometric design elements. King Aerospace Commercial Corporation (KACC), a leading aircraft services provider, was recently awarded a paint contract for a green Boeing Business Jet (BBJ) owned by an undisclosed private individual. The contract was awarded to KACC, a refurbishment and modification center for vvip aircraft in Ardmore, Oklahoma, as a subcontract from Aeria Luxury Interiors of San Antonio, Texas. 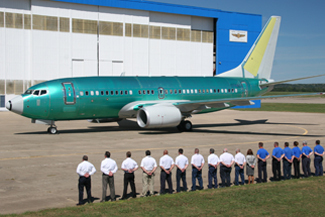 The green BBJ's complex paint scheme includes four separate silver and blue pearl paints as well as multiple, nose-to-tail geometric design elements. Other recent projects at KACC include refurbishment and maintenance on two vvip aircraft, one for a private owner and the other for a foreign head of state. To extend its capabilities to perform services on vvip aircraft, including BBJ and Airbus, KACC has invested heavily in its 200,000-square-foot, FAA-certified facility where it specializes in avionics, interiors, maintenance and paint.